Pinpointe is the email management system for mid-sized businesses. If your start up has taken off the training wheels and needs the same sophisticated automation as a large corporation, Pinpointe is the leading choice. Their focus on the big business features like cloud-based solutions and major automation capabilities makes them perfect for campaigns that send big volumes of email, even up to 20 million emails a month. The company was created by executives from Silicon Valley, who understand the need for email marketing on a mega level, especially for your business-to-businesses services. Because Pinpointe targets those business-to-business services, they excel with their reporting tools. Using Google Analytics, Pinpointe will measure the clicks, conversion rates, and other transactions. They also feature a tool called “digital footprints”, which allows you to see exactly what reactions were caused by your emails. If you want to look at your effectiveness as a whole, you can, or you can apply some blinders and look at very specific data to get a good idea of how new features in your newsletter work for your business. Pinpointe also has a fully customizable auto response feature. They understand that email campaigns work best when you follow up. You can create trigger campaigns that have specific and personal reactions to any new interaction with your mailing list. You can even create auto responses that come from different members of your team, so you can target regional customers with emails from the manager from that area, or simply send out a personal message that welcomes new clients to your mailing list. As far as subscriber organization goes, Pinpointe has one of the most detailed segment features out of all the major email management services. You can group your clients based on the amount or type of links they click, or by those who tend to open emails, in addition to the standard demographic information. Pinpointe provides a drop-down list of the most useful types of mailing list organization, but you can also completely customize your segments into whatever groups make the most sense for your organization. You can even send out emails that are the same for all your clients except those on a specific segment. Those clients will see dynamic blocks of data that are best suited to their shopping or consumption habits. Group your clients into segments that respond better to images, and send them image-rich campaigns that generate responses. Group others into segments that click through often, and utilize links to gain their interaction. Pinpointe makes it easy to truly use all the information you have to best serve your clients. If Pinpointe has any weak spots, it can only be in that they offer no free plan, and that their customer service is available only through email. With a focus on medium-sized businesses, and business-to-business services, their client base is not generally made of the same types of professionals who would choose services like iContact or MailChimp. 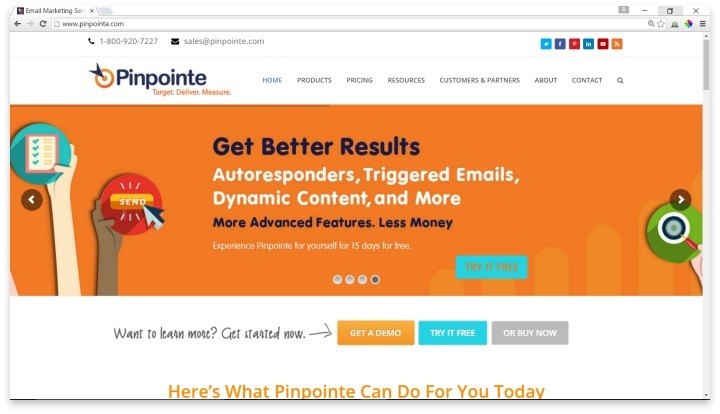 Pinpointe is an email management system for mid-sized businesses that makes it easy to sign up and get going, without a contract, and with zero fees. If your business has outgrown your current email management system, Pinpointe is the premier option. They make it easy to sign up and get going, without a contract, and with zero fees. Have you had an experience with this company? Please share your Pinpointe reviews below.